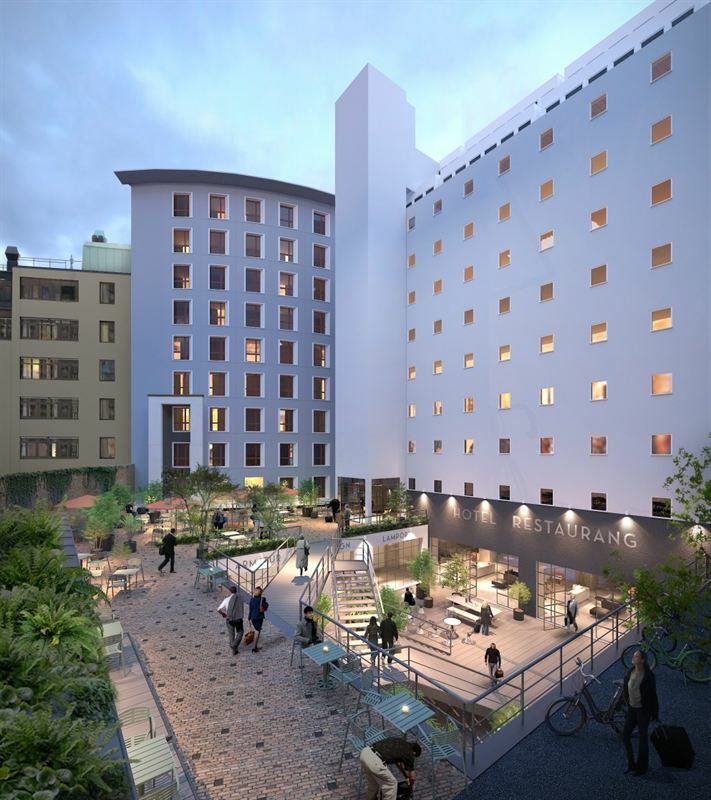 Kungsleden has signed a 20 year lease agreement with Nobis to develop a new design hotel on Gävlegatan in the heart of Vasastan and Hagastaden in Stockholm. The hotel will with its 242 hotel rooms, conference facilities and restaurant, become a new destination for hotel guests, neighbours, residents and tourists. Kungsleden AB (publ) has owned the property Blästern 14 on Gävlegatan in Stockholm, next to Torsplan and the new district Hagastaden, since 2014. The property comprises 15,000 sqm office and garage space, which will be re-developed into a 9,500 sqm design hotel and 5,500 sqm of functional office space. The property Blästern 14 has a unique history going back to the 1930’s when architect Sigurd Lewerentz designed the building, which has served as office and warehouse for Philips Sweden. The building’s history has had a significant influence on Kungsleden’s and Nobis’ conceptual design with small but functional and attractive rooms as well as long-stay rooms. The ambition is to create a new destination and meeting place with great vibes and service in the spacious restaurant, bar and lounge areas, moving seamlessly between the indoor environment and the welcoming courtyard. “Stockholm is a unique city with fantastic open areas behind our beautiful facades, but often closed off for the general public. Instead, we want to open a welcoming courtyard and create a destination together with Nobis – an oasis in the city – in Stockholm’s most expansive and exciting areas where everybody will be welcome to experience something special”, says Biljana Pehrsson, CEO Kungsleden. “We want to offer a hotel project of high quality to a good price. We will offer smaller rooms but to the same high quality and experience as we have at our other hotels. This is a concept which I have wanted to develop for a very long time and I look forward to realizing it together with Kungsleden”, comments Sandro Catenacci, CEO Nobis AB. Kungsleden invests SEK 385 million in the project which totals 15,000 sqm. The first phase includes the hotel of 9,500 sqm and 242 rooms, expected to be finished during autumn 2018. The second phase includes 5,500 sqm of office space in the building facing Gävlegatan and is expected to be finished in 2021. Annordia has served as advisors to Kungsleden. The information was provided for public release on 29 February 2016 at 07:00 a.m.